Knickerbocker Partition Corporation was founded in 1951 in New York City and later moved to Brooklyn in 1960. In 1969, the company built a new manufacturing plant in Freeport, New York and moved to that location where it is still located today. Knickerbocker also has facilities in Chicago, Dallas Fort Worth and San Francisco. The company is rich in family history and it is known worldwide as a leader in public restroom partitions. 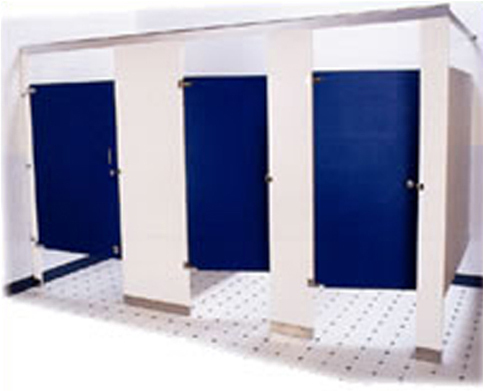 Powder Coated Steel Toilet Partitions – This material is the most economical material and has the quickest lead-time. If needed, customers can request antimicrobial coating to increase it’s durability. Graffiti resistant colors are available in this material with a quick shipping time of 2-3 weeks. A nickel plate color is available and it is highly desirable due to it’s stainless steel appearance and low cost point. Knickerbocker offers a Wedge Screen Cantilever designed urinal screen for usage in cases where maximum stability is need. The powder coated steel bathroom partitions are available in Metropolitan Style (floor mounted, overhead braced), New Yorker Style (floor mounted), and Gramercy Style (floor to ceiling mounted) mounting. Stainless Steel Toilet Partitions – This is Knickerbockers premium line of partitions which features 304 stainless steel with a #4 polish. This material is rust proof, corrosion resistant, and ideal for high humidity areas. The appearance works great with any color restroom and it also has an option for textured patterns. This material will arrive with a PVC coating to protect the material during installation. After installing, buyers simply remove the coating layer. The stainless steel bathroom partitions are available in Metropolitan Style (floor mounted, overhead braced), New Yorker Style (floor mounted), and Gramercy Style (floor to ceiling mounted) mounting. HDPE Toilet Partitions – Knickerbockers’s Plastique SP material is HDPE 1” solid plastic. This material option is generally used in high traffic bathrooms such as sports arenas, schools, and hospitals. This material is impact resistant and can be used in areas that have exposure to moisture and steam which makes it a great option for use in shower and locker rooms at schools, athletic clubs, YMCA facilities, and pool areas. The material is available in Metropolitan Style (floor mounted, overhead braced), New Yorker Style (floor mounted), Empire (ceiling mounted), and Gramercy Style (floor to ceiling mounted) mounting. High Pressure Laminate Toilet Partitions –This material option offers a large variety of design options including solid colors, patterns and wood grains. The available colors come from leading decorative laminate manufacturers including Wilsonart®, Pionite®, Nevamar® and Formica®. The bathroom stalls arrive with a concealed latch mechanism and non-rising hinge system. They support limited corrosion and rust, while also being used for dressing/changing areas where no moister is around. The material is available in Metropolitan Style (floor mounted, overhead braced), New Yorker Style (floor mounted), and Gramercy Style (floor to ceiling mounted) mounting. Solid Phenolic Core Toilet Partitions – When durability is needed, this material is the best option because it is impact resistant, will not chip, dent or delaminate, and works well in moisture. It has a classB flame spread rating and class A is available if needed. Due to this it will never carry a flame, melt, or warp. This material can be used in shower and locker rooms and high traffic areas. These bathroom stalls are available in a wide range of colors, patterns, wood grains, and includes mounting options in Metropolitan Style (floor mounted, overhead braced), New Yorker Style (floor mounted), Empire (ceiling mounted), and Gramercy Style (floor to ceiling mounted) mounting. Knickerbocker offers three types of shower units that include Gang Shower Stalls, Showers with Dressing Rooms and Standard Shower Cabinets, and Shower Cabinets for the Physically Handicapped. The head rail bracing doubles as the curtain track on the shower units. The shower cabinets for the physically handicapped feature flush-wall self-contained stalls. Panels can also be reinforced to support grab bars and folding seats and come with a threshold rap to provide roll in wheelchair access. All shower units come with curtain, curtain rod and hooks, soap dish and brass drain with stainless steel strainer. Shower units are available in Stainless Steel, Powder Coated Steel, Phenolic Core and Solid Plastique. The Metropolitan style is floor anchored, overhead braced. It has great structural stability making it the most preferred mounting choice. The Empire style mounting is ceiling mounted and provided a clear area below to clean floors. The New Yorker Style mounting makes your room look spacious because it is mounted to the floor but above the partition is open to make your room look larger. The Gramercy style is when great support is needed, as it is mounted to the ceiling and floor which provides the most structural stability. Knickerbocker also offers an Entrance Screen to provide privacy and reduce site into the bathroom from the hallway. Available with either a pilaster or a floor to ceiling post for stability. Knickerbocker offers a Tough Guy Series when a more vandal resistant product is needed. It offers continuous hinges and brackets, additional door strikes and site strips. Knickerbocker products can help with your LEED credits on building projects that are LEED certified. Each Knickerbocker Partition material carries LEED Credits based on the material properties. All materials contain recycled content. Knickerbocker has four locations to ship material from including Chicago, Dallas, San Francisco and Freeport, New York. Lead time is approximately 2-3 weeks, and with their emergency hot ship program, some powder coated steel colors can ship within a one week time frame. Knickerbocker Partition Replacement parts and hardware are also readily available and in stock to ship quick.